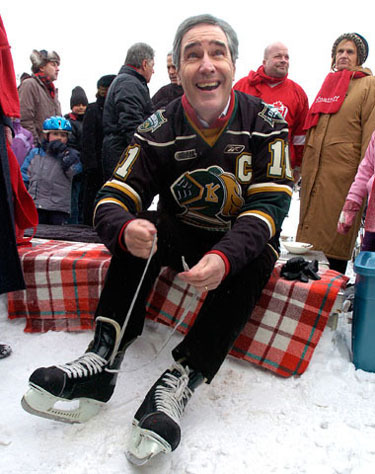 Liberal leader Michael Ignatieff laced up his skates at Victoria Park in London, Ontario on Sunday, January 16, 2011. The visit was part of a 20-ridings-in-11-days-election-style tour. Cleverly enough, he was wearing the jersey of the London Knights in the Ontario Hockey League. SUE REEVE/THE LONDON FREE PRESS/QMI AGENCY. This coming Sunday, January 23 will mark the fifth anniversary of the 2006 Canadian federal election that first brought the Harper Conservative minority government to office. And Mr. Harper himself apparently thinks there is a “50-50 chance of election this year” (nudge, nudge, wink, wink, as they used to say on Monty Python). If there is an election in 2011 (precipitated by lack of majority support for the upcoming federal budget in Parliament, say), the current common wisdom is that it will probably return yet another Harper Conservative minority government. Last week’s EKOS poll, eg, noted a “7-point CPC lead.” This past Sunday the Threehundredeight.com numbers in the Globe and Mail, incorporating the “latest polls from EKOS, Angus-Reid, Probe Research and CROP,” put the Conservatives at 35.4%, the Liberals at 29%, and the New Democrats at 15.7%. And yet … cast your mind back to the late fall and early winter of 2005. According to Strategic Counsel polling data, prepared for CTV and the Globe and Mail, as of November 5–6 (about two and a half months before the January 23, 2006 election) Paul Martin’s Liberals had a 7-point lead over Stephen Harper’s Conservatives. As of Nov 30–Dec 3 (a mere month and a half before the 2006 election), the Liberals were at 34%, the Conservatives 30%, and the New Democrats 16%. 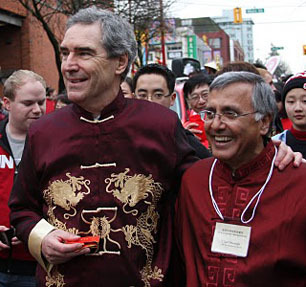 Michael Ignatieff at Chinese New Year Parade in Vancouver, February 2010, with Ujjal Dosanjh, former New Democratic premier of British Columbia, current Liberal MP for Vancouver South. Gordon Gibson feels that a new Ignatieff Liberal message may be percolating as well. And its first element is “the claim that this will be an election about the team, not the leaders.” This may or may not be entirely true. But it could in any case prove attractive to substantial numbers of Canadians, put off by Mr. Harper’s one-man-bully image, at a time of enhanced scepticism about heroes and heroic deeds. 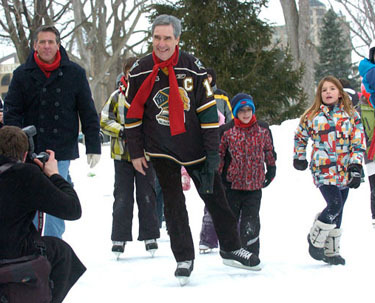 Having laced up his skates, Liberal leader Michael Ignatieff took a spin on the ice at Victoria Park in London. After the skating excursion, Ignatieff walked a block to The Grand Theatre where he held a meet and greet with Liberal supporters. SUE REEVE/THE LONDON FREE PRESS/QMI AGENCY. On the other hand (Canadian politics always has another hand), there are still more than a few signs that the Ignatieff Liberals are, at best, just at the very beginning of some more positive vein of silver that may very well not pan out in the end (or at least not in time for a 2011 election). According to the latest federal political soundings in la belle province, “les troupes de Gilles Duceppe récoltent 36 % des intentions de vote, loin devant le Parti libéral du Canada et le NPD, qui demeurent à égalité pour un troisième mois consécutif, à 19 %. Le Parti conservateur est crédité de 17 % et le Parti vert du Canada, de 6 %.” The old Liberal dominance in Quebec — from the days of Laurier to Trudeau (with only a very few exceptions) now survives only among “Non-francophones.” SOURCE: Sondage Léger Marketing-Le Devoir. 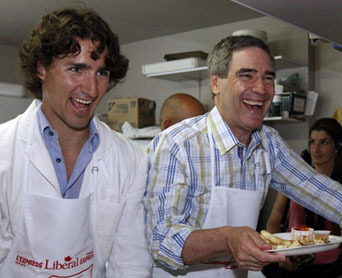 Michael Ignatieff serves pancakes with Liberal MP Justin Trudeau in Frampton, Quebec, July 21, 2010. Gordon Gibson would say “details won’t emerge until an election is called, but the broad themes of the Liberal pitch are becoming clear.” Yet I have some raw sense of what the Belleville Intelligencer means myself. This makes a lot of sense — especially when you remember a recent Globe and Mail column by Gerry Nicholls, who used to work with Stephen Harper at the National Citizens Coalition. (Get rid of the Liberals, and the Conservatives are just in a contest with the NDP, which they will almost always win, or so an old Harper theory apparently prophesies.) But then I find myself wondering: what is the current Liberal plan for Canada anyway, beyond vague rhetoric about “our priorities are education, learning, care, getting the deficit under control”? 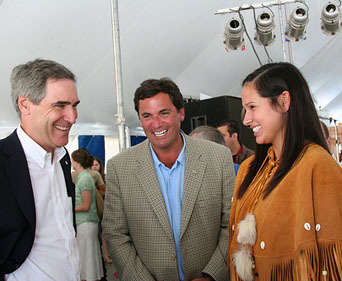 Liberal Leader Michael Ignatieff and New Brunswick Liberal MP Dominic LeBlanc, with Mi'Kmaq songstress, Holly Sock, Richibucto, NB, August 2010. As a broad theme, I like Ignatieff’s talk about the need to strengthen the “democratic process” in Canada. Some say only academic political scientists are interested, but I don’t think that’s right. Canadian democracy needs to be strengthened in big ways if Canada itself is going to get through the next several decades, I think. I also think many ordinary voters appreciate this point at some raw instinctual level. And it’s a theme that can be pursued without spending much money at all. It blends nicely with deficit reduction objectives. So … the Liberals need their own workable long-term plan for Senate reform, eg, to help attract the Western Canadian support they still do not have at all enough of. (And if you are going to criticize Stephen Harper for not reforming the Senate as promised, you ought to have a better plan yourself.) The current office of governor general needs to be democratized, just like the make-believe British House of Lords in the current unreformed Senate of Canada. The constructive recognition of the Québécois as a nation within a united Canada from four years ago (which Michael Ignatieff seems to have played some role in inspiring and facilitating) needs further work and clarification. And Canada still lacks a realistic democratic aboriginal development policy — at a time when the interface between aboriginal rights and northern resource development has increasing implications for Canadian economic growth. 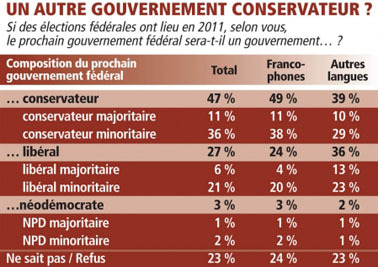 The Québécois nation in a united Canada is not going to vote for the Harper Conservatives in any serious numbers itself. But close to a majority in this ancient part of the country thinks the next federal election will nonetheless return either a Harper Conservative minority or majority government. Of course, they could be wrong: the rest of Canada could be a little closer to their own preferences than they think. Specific plans for practical democratic reform in a reviving and restructuring new Canadian political economy will only be able to unfold over a comparatively long time period. All the Liberals need now are outlines of a gradual process of concrete actions down the road — tied in with shorter term plans for improving the economic circumstances of the middle class family. And Ignatieff is no doubt already right about one thing: a lot of serious listening will have to happen along the way. But Pierre Trudeau — to take one obvious case in point — commanded respect even from some who did not otherwise like or admire him because he did seem to have some visceral grasp of Canada’s future, and just where he was trying to lead it. We finally understood one big piece of his puzzle with the Constitution Act 1982, and its accompanying Canadian Charter of Rights and Freedoms. At the same time, Trudeau was far from perfect, and he has left quite a lot of unfinished Canadian business. His Liberal Party of Canada needs to start showing the country that it has some fresh ideas about how to address this unfinished business (something Stephen Harper, over the past five years, has more or less definitively shown he is just not interested in). As matters stand, my own guess would be that, for a host of different reasons, Iggy is probably not the person who will lead Canada into its next version of the promised land, a bit further down the road. But, watching him grow and develop over the past year or so — watching how, as Gordon Gibson says, he has “become considerably more at ease with his situation and his audience,” how the “distant professor has been overtaken by the reassuring politician,” is enough to make you think he just might be good enough to set the stage, in some constructive way. 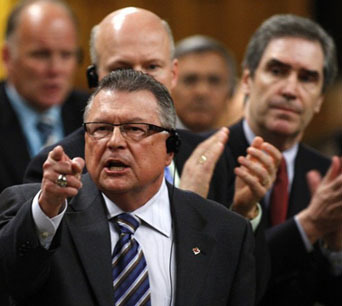 Another team player: Liberal MP for Wascana in Saskatchewan, Ralph Goodale, receives a standing ovation while speaking during Question Period in Ottawa, as Michael Ignatieff looks on, May 2008. The prospects for his success may look somewhat better as well, when you ponder the rather narrow (if still quite important) objectives any realistic analysis for an election this year will put before him. At the minimalist end, all he has to do is stop an actual Harper Conservative majority in the elected branch of Parliament, and win, say, at least 100 Liberal seats. That would probably give him and his party enough to remain competitive in another election, where bigger things are possible. At the maximum-agenda end of things for 2011, it seems to me, if his Liberals were to win, even by just a whisker, the largest plurality of seats in the Canadian House of Commons, setting the stage for some form of progressive (but still essentially centrist and economically responsible) governing accord with the Layton New Democrats, that would be nirvana — or at least close enough for jazz. 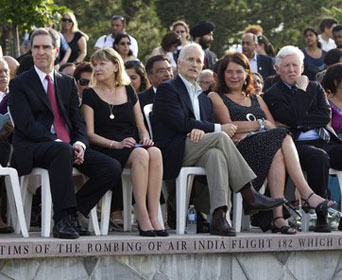 Liberal leader Michael Ignatieff (l), New Democratic Party (NDP) leader Jack Layton (c), and Liberal Party MP (and former Ontario NDP premier) Bob Rae (r) sit at 25th anniversary memorial gathering at the Air India monument in Toronto, June 23, 2010. No doubt as well, the prospects for this current maximum agenda are cloudy at best, as matters stand. It may be all the Ignatieff Liberals will be able to do is prevent an actual Harper Conservative majority. And, speaking strictly as an analyst I would agree that while a Liberal majority is altogether out of the question, a Conservative majority may not be (although the hard evidence for this alternative also seems very thin to me, at best). Nonetheless, at this exact point in time, my guess is that Gordon Gibson from BC has at least got one thing right: “The coming election is not won yet by anyone. With a stronger Michael Ignatieff, it will be a horse race.” Six months ago I would not have rushed to quite this judgment. But times change, even in Canada. And it does seem to me the best bet now (granting that, in politics, everything can change again overnight, etc, etc, etc).